I love, love, love when I can tie together hands on science lessons with Bible content! 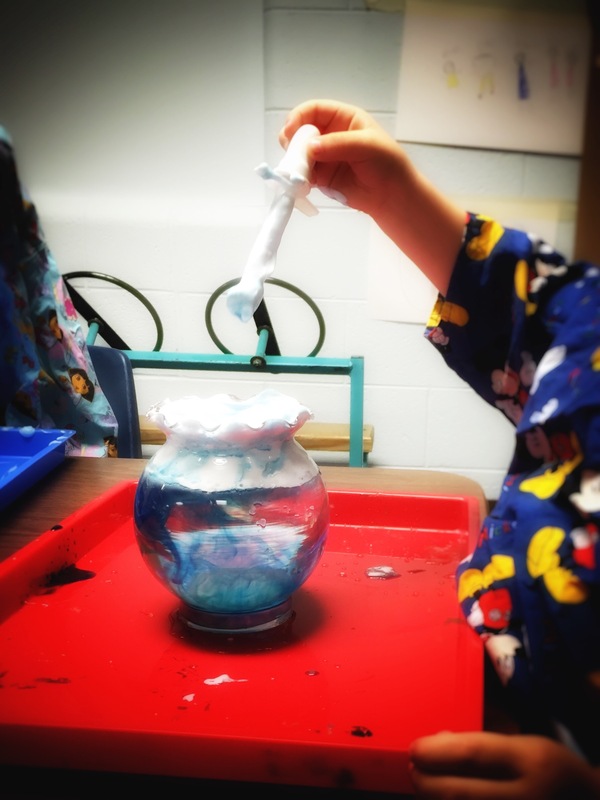 For our Noah’s Ark Bible lesson, I knew the kids would really be excited about the rain in a jar activities I had seen all over Pinterest, so we tried it with our AWANA Cubbies (3 and 4 year olds). 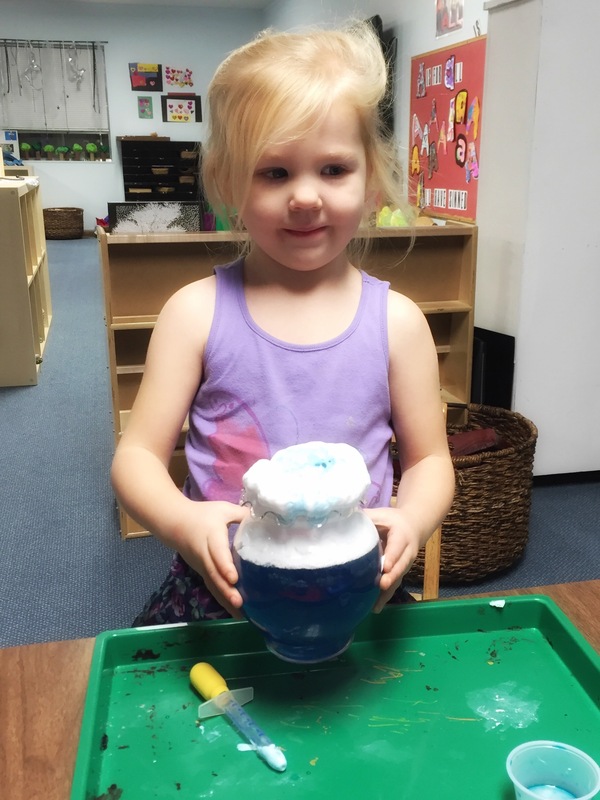 The basic science behind this project is that the shaving cream on top of the water becomes saturated and then it begins to “rain” into the jar below. I am sure the technical science is lost on these kiddos, but they were fully invested in making it rain. The hardest part was getting them to stop so others could have a turn! I know these kids love any activity involving shaving cream. The AWANA curriculum divides the Noah story up into several lessons and this week’s lesson focused in on the Great Flood. This can be a tricky story to tell to young children because we don’t want to overwhelm them by focusing on what happened to all the people who weren’t on the ark. When I teach a Noah’s ark Bible lesson for kids I focus on Noah’s righteousness in the sight of God and God’s provision for Noah and his family as well as the animals on the ark. However, I don’t think we should underestimate children’s understanding of good and evil. Their childlike faith allows them to easily hold in tension a God that is fully just and fully loving. Something we sometimes over complicate as we get older and our reasoning capabilities increase. Just because we are uncomfortable with a God who enforces consequences doesn’t mean we can ignore that aspect of His character. There is a danger in over teaching a story such as Noah’s ark, a favorite from infancy that even people who know little else about the Bible will be familiar with. Kids can grow up thinking they KNOW all there is to know about a story like Noah and the Ark, when in reality they have put very little thought into understanding how broken the world must have been and how God’s “fix” for the situation, though mighty, was just a band-aid compared to the glorious gift that is ours through Christ’s sacrifice and ultimate atonement on the cross for those who BELIEVE! and just as belief was what set Noah apart in his day, our belief sets us apart in ours. Faith matters and consequences for disbelief still exist. That should move us to action. Supplies for this project include shaving cream, water, clear jars (our church has tons of those clear short vases to use as centerpieces and they were perfect), pipettes, and food coloring. 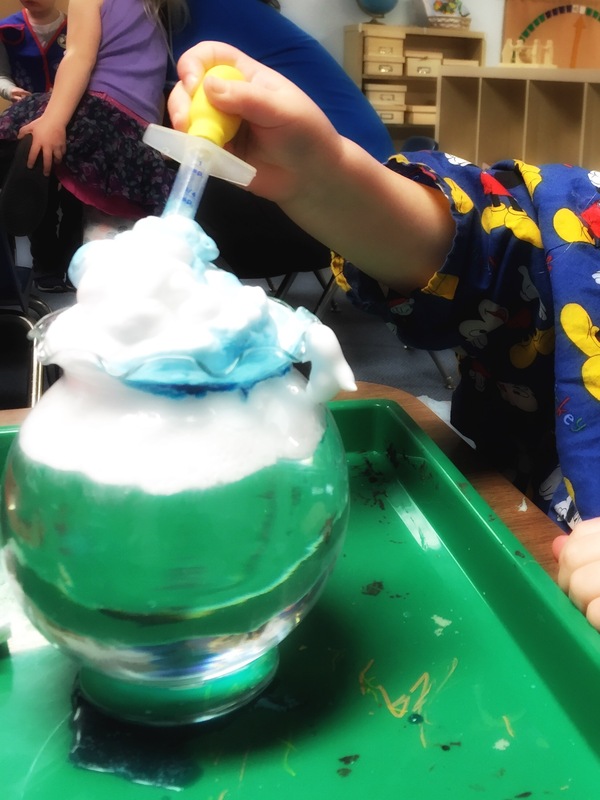 We found it helpful to give each child a tray with the jar of water filled almost to the top, a pipette, a smaller container of water mixed with food coloring and when they were ready to start we put the shaving cream on top of the water. I showed each child how to use the pipette and we limited the activity to four at a time. I provided smocks in case the food coloring got out of control, but this wasn’t nearly as messy as I expected. Some of the kids wanted to stir the shaving cream which was counter-productive to the activity, but process is more important than product in this case. When it was time to switch and let new people do the activity, we used clean jars because the shaving cream doesn’t “dump out” easily. If you have access to a sink where you can rinse the jars quickly they could be reused. This worked best when we only allowed about four children to do the activity at a time. We set our other learning center activities for the children to do while they waited. When we explained the activity, we talked about the rain God sent while Noah was in the ark which reinforced the learning from our formal story time and the lesson they work on at home with their parents. For more of our Noah’s Ark Bible Lesson, see my post about making a button rainbow here. Also, check out my Pinterest board, Fall, Flood, Babel, for more creative Noah’s ark lesson ideas and other Genesis stories. Nicodemus visits Jesus at night in felt.